The first major decision was for the league to create its own standard of play. Since the league’s inception in 1920, the rules governing competition were legislated by college football, which had hamstrung the NFL’s growth by preventing the pro game from differentiating itself from the college game. With its own set of rules ready for 1933, the NFL began to establish its own identity and attract new fans with a different style of play. The main intent was to create more excitement on offense and increase scoring. The catalyst for this unprecedented change was spontaneous improvisation. The NFL had no firmly-established tie-breaking procedure in place at the close of the 1932 regular season. The 6-1-6 Chicago Bears and 6-1-4 Portsmouth Spartans finished officially tied for first place, as ties were not factored into winning percentages at the time. Their 6-1 equated as a 0.857 winning percentage, and during the season the two had played one another to 13-13 and 7-7 ties. There had been too many disputed championships in the 1920’s and the owners did not desire another. For the first time, a playoff game was arranged to decide who would be declared champion. A blizzard followed by subzero temperatures forced the game to hastily be shifted indoors from Wrigley Field to Chicago Stadium, which had a considerably smaller playing surface. Some of the special ground rules put in place for the game gave a glimpse into the future of football, as well as a controversy that arose late in the game. The confined space only allowed for a field that was 80 yards in length and approximately 50 yards in width, with the sidelines nearly abutted to the grandstands. The actual playing field was 69-yards from goal line to goal line. The end zones were smaller than regulation and rounded along the end line to fit within the contours of the field that was shaped like a hockey rink. As a precaution, inbounds markers were placed on the field to allow play to begin more toward the center of the field instead of right on the sideline following an out-of-bounds play. This proved to be a revelation, as fewer downs were wasted attempting to center the ball, and also allowed for more productive offensive plays with more of the field was available to use. The goal posts were also moved up from the end line to the goal line. The game was tied 0-0 five minutes into the fourth quarter. 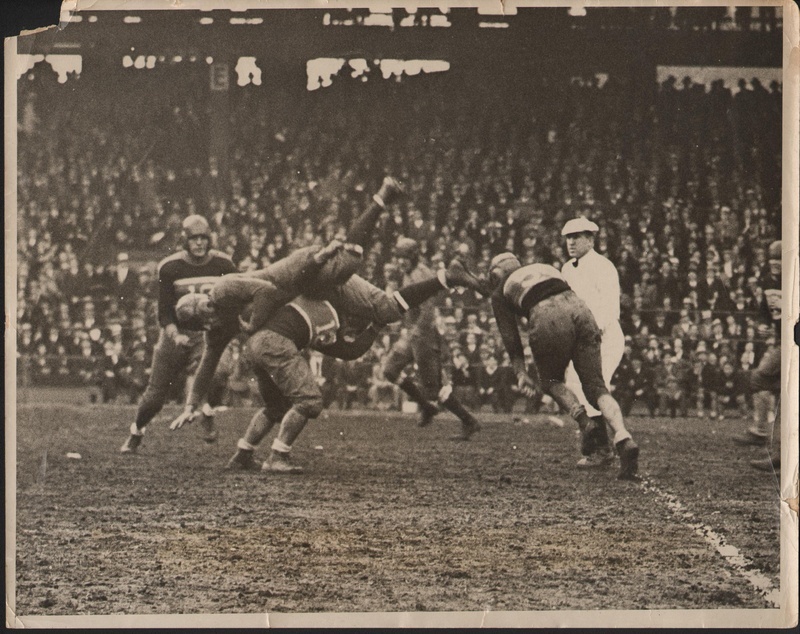 On fourth-and-goal from the Spartans two-yard line, Chicago fullback Bronko Nagurski charged toward the line, but abruptly pulled up and lofted a pass into the hands of teammate Red Grange for a touchdown. Portsmouth head coach Potsy Clark immediately stormed the field in protest, claiming Nagurski was not the required five yards behind the line of scrimmage when he passed the ball forward. Referee Bobby Cahn upheld the ruling and the touchdown stood. 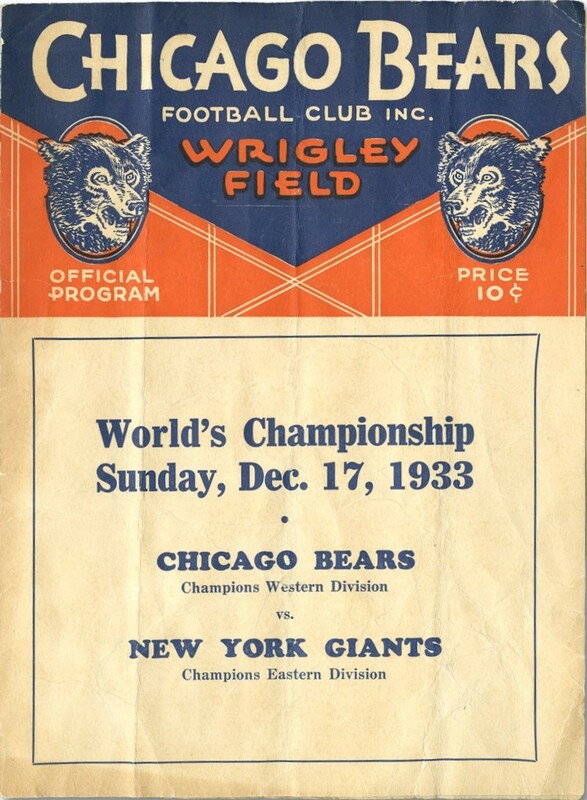 The Bears held on for a 9-0 victory and were professional football’s champions for 1932. The NFL declared it would no longer strictly adhere to the college rule book and forged its own code on February 25, 1933. Although the professional parameters were still strongly rooted to the college game, the differences were significant and would ultimately prove to stimulate a more open and entertaining brand of football. Higher scoring games also decreased the likelihood of tie games, a direct response to the fact that the participating teams in the 1932 playoff participated in a total of 10 tie contests. The goalposts were moved to the goal line to make field goals a more attractive option. In-bound lines were added to the field to keep plays from being wasted merely to center the ball on the field. The ball carrier was not ruled down unless contacted by a defender. Structural differentiation occurred by borrowing ideas from major league baseball. Boston Redskins owner George Preston Marshall and Chicago Bears owner George Halas championed the idea of splitting the NFL into Eastern and Western divisions and having the two first-place teams meet in what they conceived as a “World Series of Football.” Splitting into divisions created “pennant races” that fans would follow, stimulating interest in more cities around the league as more teams had the opportunity to qualify for the championship. The annual championship game would also once-and-forever eliminate disputed championships. Everything would be settled on the field. This reorganization was officially implemented on July 8, 1933, and the site of the championship was predetermined on a rotating basis. The Western Division champion would host the game in 1933 and all subsequent odd-numbered years while the Eastern champion would host in 1934 and all further even-numbered years. This system remained unchanged until expansion caused the league to realign into four divisions in 1967. The NFL expanded to ten teams in 1933, up from its all-time low of eight in 1932. The placement of the new franchises was significant. Beginning in the late 1920’s, NFL President Joe Carr mandated that the league migrate from large towns and small cities into large cities, especially ones that had a major league baseball team. This helped elevate the NFL’s image, as many pro football teams would share stadiums with their baseball counterparts. 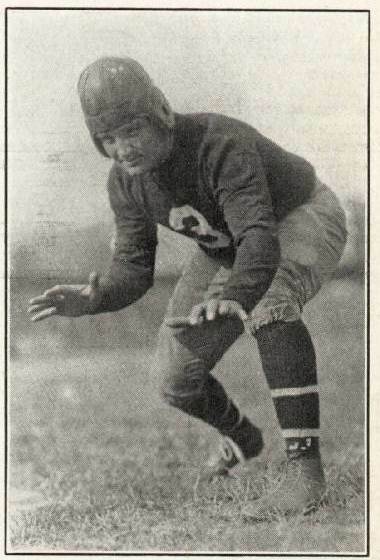 The Staten Island Stapes withdrew from the NFL after the 1932 season (but would continue as an independent team and occasionally play NFL teams in exhibition matches.) Three new franchises received league charters and were based in Cincinnati, Philadelphia and Pittsburgh. The number of franchises that had competed at least one season in the APFA/NFL was now at 51 in the circuit’s 14th season. The realignment featuring two five-team divisions operating from large metropolitan areas gave the NFL much needed stability. The days of impermanent and transient franchises were drawing to a close. Player statistics were officially recorded by the league for the first time in 1932. Weekly postings of league leaders were distributed to the press and printed in newspapers beginning in 1933. This gave fans an interactive experience, allowing them to follow their favorite players as they would during baseball season by tracking the league-leaders in batting average and ERA. The Giants themselves also underwent a transformation prior to the season, having endured back-to-back disappointing seasons as the core of the team that had challenged for the league title in 1929 and 1930 got old. The core of New York’s team was its perennially-powerful line. Ray Flaherty and Red Badgro were the best pair of ends in pro football. The interior line was anchored by Len Grant, Butch Gibson, Mel Hein, Potsy Jones and Bill Owen. 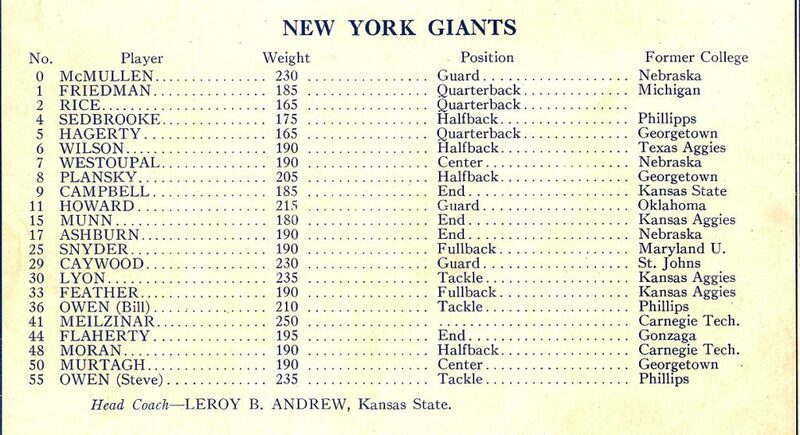 The infusion of new blood took place in the backfield, with fullback Bo Molenda, tailback Harry Newman and halfback Ken Strong, the latter signing with the Giants after the Staten Island Stapes left the league. 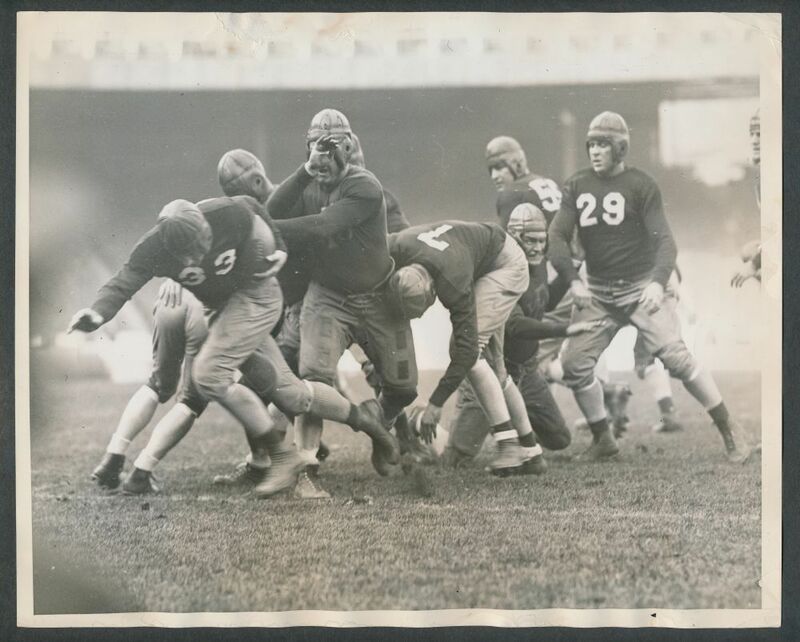 Following four weeks of drills and practice in Pompton Lakes, NJ and exhibition games versus the All-Long Island Stars and Patterson Night Hawks, the 1933 New York Football Giants opened the season with a five-game, three-week road trip. The league opener was a Wednesday-night contest, pitting the Giants against the Pittsburgh Pirates in their inaugural football game. The Pittsburgh Press said Newman “stole the show” and “did everything with the ball but swallow it,” while comparing him to baseball pitching great Carl Hubbell. The crowd of 25,000 remained enthusiastic, despite the Giants dominant performance. Newman scored on a 5-yard rush and threw a 37-yard touchdown pass to Dale Burnett. 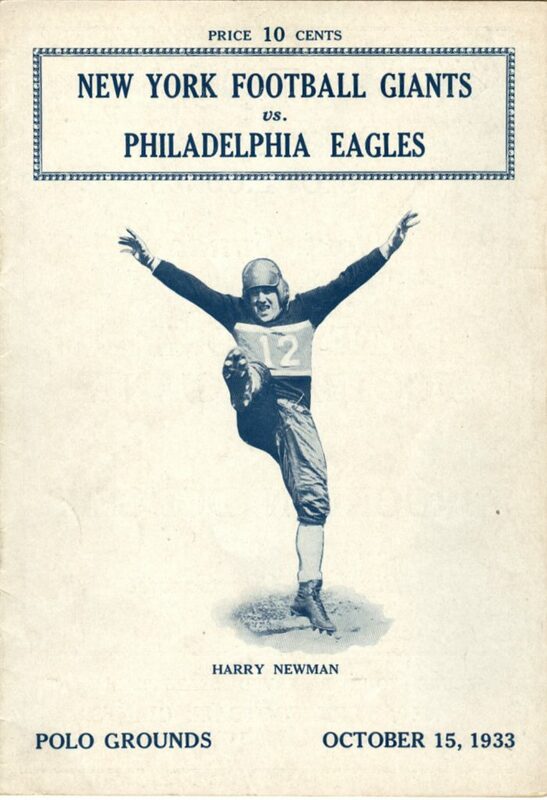 Perhaps most pleasing to Coach Steve Owen, however, was Newman’s successful 39-yard field goal, as no New York kicker successfully made a field goal during the entire 1932 season. Strong also had a good all-around game for the Giants, scoring on an interception return and two point-afters. The Pirates only score came on a safety when the ball skittered though the end zone in the third quarter when Strong’s punt was blocked. The Giants won 23-2. New York was overwhelmed by the Spartans and 90-degree temperatures four days later in Portsmouth. Tailback Glenn Presnell moved the Spartans offense up and down the field on New York in front of 7,000 fans. Portsmouth had the game well in hand, 17-0 in the fourth quarter, when the Giants avoided a shutout with an unusual play. Newman called his own number on a rush from the Spartans 45-yard line, ran through the line and into the secondary. He fumbled the ball when hit from behind, but teammate Red Badgro was nearby to scoop the loose ball at the 20-yard line and take it the rest of the way for the touchdown. Strong added the point-after from placement and the final score was 17-7. The busy road trip continued with an exhibition contest at the Indianapolis Indians on Wednesday before a league contest versus Green Bay at Milwaukee. New York headed back to the East Coast for one last road game in Boston. The newly renamed Redskins were building themselves into a rugged outfit. They were strong on the line of scrimmage and had one of the great young backs in the league in Cliff Battles. After jumping out to a 7-0 lead in the first quarter, Boston gained control of the tempo and pounded out long drives for a 21-7 lead in the third quarter. New York fought back. Stu Clancy connected with Flaherty on a 35-yard aerial, and then finished the drive with a 15-yard rush into the end zone. However, Glenn “Turk” Edwards pierced the line and blocked Newman’s point-after attempt, leaving New York behind 21-13. Late in the fourth quarter, the Giants had the ball on their 20-yard line and were desperate for a quick score. Newman took the snap from center, sprinted toward the edge and flipped a lateral toward a teammate who missed the ball. Newman retrieved the ball on the 10-yard line, reversed field, and traversed the distance for an 80-yard touchdown. His point-after was good, bringing the score to 21-20. Newman’s long run gave him 108 yards for the contest, and earned him the distinction of being the first officially recognized 100-yard rusher in franchise history. Unfortunately for the Giants, this was not the only accolade of the day. The Redskins were able to run out the clock before New York could threaten again. Battles carried the ball 16 times for 215 yards and a touchdown in the first officially recorded 200-yard rushing performance in pro football history. The Giants headed back to Harlem with a 2-2 record. The environs of the Polo Grounds definitely agreed with Owen’s team in 1933. If they felt road weary after their five-games-over-three-weeks road trip, they certainly recovered in a hurry. New York opened their home schedule with a record-setting romp in their first-ever meeting with Philadelphia in front of 18,000 fans. The Giants eight touchdowns were scored by six different players: five were rushing and three passing, with Molenda and Kink Richards each going over twice. New York had totaled eight touchdowns in a game against Frankford in 1930 in a 53-0 win, but only converted five point-afters. This time the Giants were eight-for-eight. Jack McBride converted four placements, Strong two, Newman one and Hap Moran passed to Newman for one. Fifty-point scores were not uncommon in the early days of professional football as mismatches often occurred between the league’s handful of established franchises and the rabble of teams that struggled to hold their rosters together. As the NFL stabilized in the later 1920’s, the level of competition became balanced as there were fewer teams and stronger rosters. One-sided blowouts became less frequent. The Giants two 50-point games in 1929 and 1933 were the only occurrences of that plateau being reached through the six-year span of 1928-1933, and New York would not reach it again until 1950. The Giants entertained the Dodgers the next week in an inter-borough battle that drew an exuberant 35,000 spectators to the Polo Grounds. Brooklyn featured familiar names to fans of the Giants: Benny Friedman, along with newcomers Chris Cagle and John “Shipwreck” Kelly, who left New York after the 1932 season and acquired a percentage of the Dodgers franchise. Newman again drew praise for his deft passing against Brooklyn’s durable defense, which came into this game off a shut out versus Cincinnati. A unique play occurred in the second quarter with New York ahead 7-0. Newman punted to the irascible Kelly, who surprisingly punted the ball right back to Newman, giving the Giants a new possession with a net loss of one yard. The Giants lead 14-0 at the half, and after leading another touchdown drive, Newman was given star treatment and was taken out to a standing ovation. Owen sent in Richards to finish the game at tailback. Friedman got the Dodgers on the scoreboard late with a fourth quarter touchdown pass. Brooklyn successfully completed an on-sides kick, but the Giants defense held and the final score was 21-7. After bolstering their record to 4-2, good for first place in the Eastern Division, the Giants boarded the train to Washington for a mid-week exhibition match before heading to the mid-West to meet a familiar foe with a new look. The Chicago Daily Tribune boasted the expected crowd was to be the largest ever at Wrigley Field for a professional football game. (The Cardinals occasionally played there when Comiskey Park was unavailable). 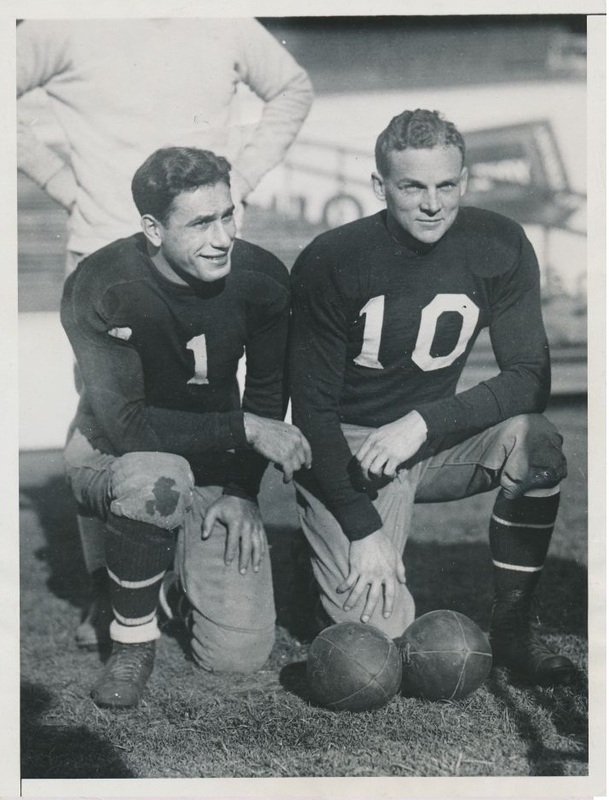 An added draw was Newman, who had many fans in the area from his time at Michigan University, and his college teammate Bill Hewitt, now on the Bears. Newman was leading the NFL in passing while also averaging five yards per rush. Halas drilled the 5-0 Bears in defensing New York’s diversified attack. 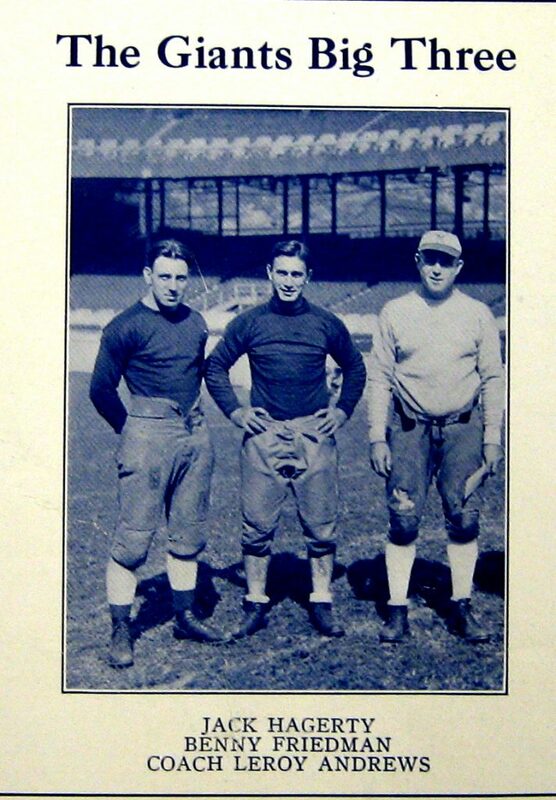 Also of note were the three active players who participated in the first Giants – Bears game at the Polo Grounds in 1925: McBride for the Giants and Red Grange and Link Lyman for Chicago, as well as Coach Halas. The Giants and Bears had met 13 times overall with Chicago holding an 8-5 advantage over their Eastern rivals. The Bears were the cardiac team of the 1933 season, having won four of their five games by coming from behind late in the final period. The Giants controlled much of the action through the first three quarters, keeping the Bears pinned deep in their own end of the field throughout the third quarter. The field position advantage finally paid off for New York when Strong was good on a 26-yard placement for a 10-7 lead. The Giants defense appeared to close the contest after recovering a fumble at mid field. Newman advanced New York to the Bears 35-yard line where the drive stalled. Luke Johnsos tipped the field position advantage and swung the momentum Chicago’s way when he broke through the line and blocked Strong’s punt, Hewitt scooped the ball and wasn’t tackled until he was dragged down from behind by Newman at New York’s 18-yard line. The comeback was on and the 28,000 Chicagoans were on their feet. Grange, who, along with Hein, played the full 60 minutes, charged forward for a first down at the eight-yard line. On third-and-goal from the 11-yard line, Keith Molesworth received the snap from center, play-faked to Johnny Sisk, and handed off to Bill Hewitt who came around from the end position. Hewitt followed blockers into the line but pulled up as a herd of New York defenders collapsed on him, and lobbed a pass to Bill Karr alone in the end zone. “Automatic” Jack Manders was good on the placement and the Bears went ahead 14-10 with six minutes to play. The Chicago defense held to preserve their perfect record at 6-0. Newman and Strong ran the ball well for the Giants, but Newman completed only two passes while having four intercepted. The Giants held Nagurski in check, but never quite got a handle on Hewitt, who was the game’s top performer. New York returned home at 4-3, just ahead of 3-3-1 Boston, who was facing the Bears at Fenway Park. The Giants hosted the always tough Spartans, a team owning a three-game winning streak over New York. The first three quarters of the game showed no reversal of fortune for either team. Glenn Presnell ran 81 yards for a touchdown and kicked a field goal for a 10-0 lead. The battle in the trenches was mostly a stalemate. Portsmouth’s front wall was fortified by All-Pro linemen Ox Emerson and George Christensen. New York’s first break came with approximately 10 minutes to play in the fourth quarter. Presnell, who was soon to leave the game from exhaustion, missed an 18-yard placement attempt. Like the blocked punt the previous week in Chicago, the momentum tipped and the door of opportunity opened. Following an exchange of punts, Newman, who had not yet completed a pass, led the Giants on a 68-yard advance. Badgro and Hank Reese began to control the line of scrimmage, clearing space for Strong, Burnett and Newman on plunges and slants. Newman completed a nine-yard pass to Flaherty and completed the drive with a 12-yard aerial to Strong, who fell backward over the goal line for a touchdown. Strong missed the point-after and the deficit remained 10-6. The aroused New York defense smothered Portsmouth on the ensuing possession and the Giants started on their 48-yard line after receiving a punt. 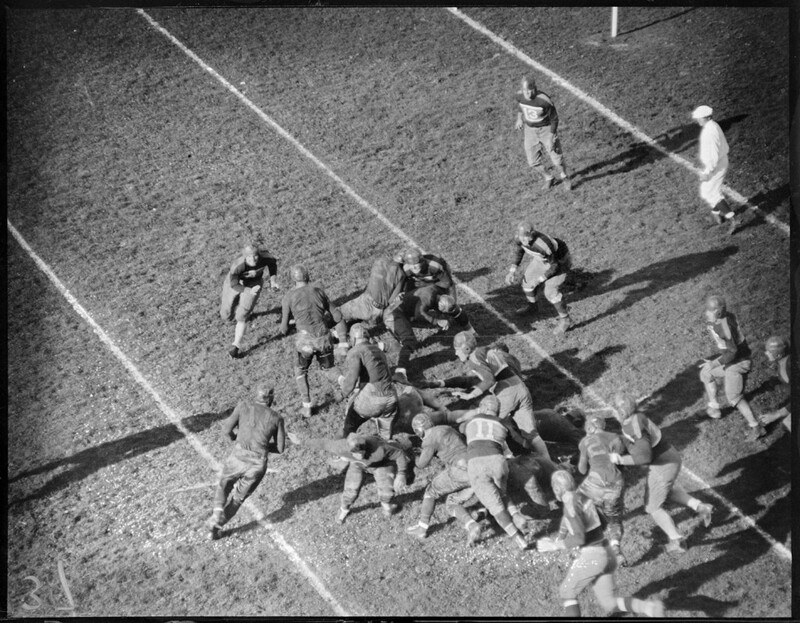 On the first snap, Newman rolled right and lofted a deep ball into the hands of Burnett at the Spartan’s 14-yard line as the Polo Grounds crowd was “galvanized into an excited, roaring mass.” A Spartans defender was penalized for a late hit on Burnett and the ball was set on the one-yard line. The Giants lined up strong to their left and Strong followed a wave of interference to go over for the winning score and added the point-after for a 13-10 victory. Presnell and Strong registered all the points for their respective teams. The Giants enthusiasm was tempered after receiving news from out of town. Boston had upset the Bears 10-0. The upcoming Redskins game at the Polo Grounds would be a pivotal match for first place in the division. The 5-3 Giants had a half-game lead over 4-3-1 Boston, but the Redskins had won the first game and a sweep would give them a tie-breaking advantage. A large crowd was expected, since the game was billed as a memorial and charity fundraiser for the late Fordham coach Major Frank Cavanaugh. A high scoring game was predicted – the Redskins led the league in rushing and the Giants led the league in passing. That proved not to be the case. The contest was a savage battle in the trenches. Boston sent Battles into the fray behind Edwards, looking to duplicate the success they enjoyed in the first game. The Giants countered with Strong plunging behind Grant. Neither team passed the ball with great success as the pressure from both defensive fronts was tremendous. It was entirely appropriate that game’s lone touchdown was scored by an unsung member of the pits. Newman sparked the Giants only sustained drive with a 15-yard return of a Battles’ punt to the New York 44-yard line in the second quarter. Strong plunged three times for a first down at the Boston 44-yard line. Newman connected on a pass to Burnett to the 28-yard line, and then ran a slant off right tackle for a first down at the Redskins 13-yard line. Three rushes left the Giants with a fourth-and-12 on the 15-yard line. Owen passed on the field goal attempt and signaled Newman to run a play. Newman took the snap from Hein, rolled to his right and fired a high pass toward the goal line. Battles was in position defending the intended receiver. He leapt up and batted the ball down. Tackle Tex Irvin had been running interference for Newman and was in the area. Irvin reached out, grabbed the deflected ball and fell over for the touchdown. Strong’s point-after gave New York a 7-0 advantage and closed out the scoring for the day. The second half was a field-position struggle featuring the punting exploits of Battles and Strong. Neither team advanced beyond the other’s 30-yard line nor there were no serious scoring threats. With a 6-3 record and a firmer hand on first place, the Giants again found disconcerting news from the out-of-town scoreboard. The Bears had shockingly been played to a 3-3 tie at Philadelphia. Halas’ team would certainly be motivated to get out of their unexpected slump when they visited the Polo Grounds the following week. In a calculated risk, Owen changed up his line-up, eschewing explosiveness for size. Given that Chicago was the league’s burliest team – their roster averaged 208 pounds, including 215 along the line – this seemed like a questionable strategy. The prospects of a defender staring down the barrel at the 267-pound George Musso running interference for the 235 pound Nagurski must have kept Owen awake at night. Strong and Newman would start the game on the bench in favor of Clancy and McBride. Owen said he would substitute the larger backs for the more dynamic pair when a scoring opportunity presented itself. Richards would also receive significant playing time subbing for Molenda, who was beat up after playing the full sixty minutes of the previous three games. From the 50-yard line, Newman received the snap, dropped back to pass, and kept retreating under a heavy rush all the way back to New York’s 25-yard line. Side-stepping and weaving through would-be tacklers, Newman headed back up-field. Most of Chicago’s defense was now behind Newman and his receivers took on the role of blockers. He advanced the ball beyond the 50-yard line and wasn’t brought to the ground until he had reached the 15-yard line for a net gain of 35 yards that electrified the 22,000 fans at the Polo Grounds. Newman completed an eight-yard pass to Turtle Campbell with just over one minute on the clock before halftime. The Giants called their fourth time out of the half and accepted the accompanying five-yard penalty (essentially a delay-of-game infraction). Deciding it was too risky to run another play, Newman called for the field goal try on second down, which Strong sent through the uprights with ease for a 3-0 Giants lead at intermission. The Bears came back with a vengeance in the third quarter. Nagurski plunged into the line and Brumbaugh flipped laterals to Sisk and delivered aerials to Molesworth during a 66-yard advance. A remarkable 25-yard play included three exchanges of the ball. Brumbaugh passed downfield to Hewitt, who lateralled to Karr. This play was Chicago’s fourth first down of the drive and set the ball goal-to-go on the seven-yard line. But on first down a lateral was mishandled and the Giants recovered the loose ball. The reprieve was temporary however. Strong launched a deep punt but Molesworth evaded several tacklers and returned it back to the New York’s 18-yard line. Sisk and Manders bucked through the line for a first-and-goal from the eight-yard line. According to The New York Times summary, “Then came the most thrilling moments of the game and a goal line stand by the Giants that had the crowd cheering frenziedly.” On successive plunges Manders, Sisk and Molesworth advanced to the one-yard stripe. Manders was stuffed again on fourth down, but New York was offside and gave Chicago another chance one half-yard from pay dirt. The Giants line penetrated and Molesworth was thrown for a three-yard loss on the fifth attempt. New York took over possession on their own four-yard line. Grant and Ollie Satenstein were cited for their exceptional efforts to come off blocks and repel the forward charge. Neither team penetrated deep into the other’s territory and Strong’s field goal held up for the 3-0 win. New York was not firmly in control of the division yet as Boston kept pace by defeating Green Bay. And Brooklyn was on an undefeated roll of their own and stood at 4-2-1. The Giants dispatched the slumping Packers the next week with relative ease, 17-6. The contest was notable for Strong’s unique free kick field goal in the second quarter. You can read more about this historic occurrence here. The Dodgers vaulted over the Redskins into second place with a 14-0 win over Boston at Ebbets Field. Brooklyn’s defense had been virtually impregnable following the 21-7 loss to New York in October. Since that game, the Dodgers surrendered only three points over five games during a 4-0-1 run (the tie game was 3-3 versus Pittsburgh). They had given up only four touchdowns thus far during the season; one to the Bears and three to the Giants. Standing at 5-2-1, a win over New York on Thanksgiving would put Brooklyn in first place by percentage points over the currently 8-3 Giants. Owen again altered his strategy for a rugged opponent, this time emphasizing the aerial attack as Brooklyn was the toughest unit to run on. The first half saw the expected physical line play from both units and three missed field goals, two by New York and one by Brooklyn. The second Giants miss was one that had the fans of both teams on their feet in anticipation of a potentially great feat. New York had the ball on Brooklyn’s 45-yard line with only seconds on the clock before halftime and elected to go for what would be a record long field goal. Newman knelt on the Giants 48-yard line for the hold. The snap and spot were perfect and New York’s front kept the Dodgers out for Strong’s booming placement. It was high and long enough but sailed just outside the right upright. Remarkably, the ball flew over the end zone and hit the Ebbets field grandstand wall before coming back to the turf. Its flight was estimated to have been 65 yards and the 28,000 fans gave Strong an ovation for his effort as the teams walked off the field for intermission. A four-play drive in the third quarter, all passes, gained 59 yards to set up Strong’s 16-yard field goal to put the Giants on top 3-0. Following an exchange of punts, New York was on the move again, now with Clancy in for Newman. Clancy plunged for three-yards and McBride completed a nine-yard pass to Flaherty for a first down. Four consecutive rushes moved the chains again and the Giants had the ball on the Dodgers 11-yard line as the game moved into the final period. Brooklyn crowded the line of scrimmage and Clancy called for a trick play. McBride received the direct snap from Hein and handed off to Molenda, who faked a line buck and tossed a diagonal pass toward Flaherty in the end zone. Flaherty was knocked down by a defender before the ball arrived and the pass interference penalty gave New York a first-and-goal on the one-yard line. Clancy went over for the score on a plunge and the Giants had the game in control after McBride’s placement made it 10-0. Brooklyn never threatened and the Giants returned to the Polo Grounds at 9-3, all but assured of the first Eastern Division title in league history. Only 10,000 spectators braved a cold rain to watch the Giants clinch the Eastern Division title against Pittsburgh. The 27-3 final score belied the frustration New York endured for most of the first three quarters. Newman passed the ball nearly at will on three long drives in the first half – including a 98-yard march between the one-yard lines – that all came up empty. With three minutes left in the third quarter, the Pirates still lead 3-0. Finally New York’s attack broke free. Newman peppered the Pittsburgh secondary with accurate strikes to sure-handed receivers and Strong capped the drive with a scoring strike of his own for a 7-3 advantage at the end of the penultimate period. Another touchdown drive gave the Giants a 14-3 lead. The Giants intercepted two passes (including one by Newman), giving New York short fields to work with and the rout was on. A surprisingly-tough Eagles team gave the Giants a run for their money to end the regular season at the snow-covered Baker Bowl in Philadelphia. Given that New York had already clinched the division and had easily rolled over the Eagles in the first meeting, they may not have been sharp. A 61-yard rush by Swede Hanson in the middle of the fourth quarter gave Philadelphia a 14-13 lead and apparent upset victory, but it was to be short lived. The 8,000 fans who withstood the winter weather were stunned to see Newman complete a 61-yard touchdown pass to Richards immediately after. The 20-14 lead held and 11-3 New York closed the season on a seven-game win streak and with a perfect 7-0 record at home. Despite the championship game being held in Chicago, Owen and the Giants were confident. Grange would not start the game for Chicago, but he would see plenty of playing time. In his ninth season of professional ball, Grange no longer possessed the breakaway speed that had earned him the moniker “The Galloping Ghost”. But he was an extremely-intelligent player and was one of Halas’ most dependable defensive backs. On Chicago’s first possession, Molesworth quick-kicked the ball over Newman’s head, and pinned New York deep in their own end. Strong punted for the Giants on third down, and Molesworth returned the ball eight yards to the New York 42-yard line. Nagurski and Gene Ronzani rushes moved the chains twice and set the ball on the 15-yard line. From there the Giants defense stiffened and Manders was good on a 16-yard placement to giving the Bears a 3-0 lead. New York resorted to deception to try to get on the scoreboard. The ball was spotted on the Bears 45-yard line, where the Giants lined up in an unbalanced formation with both guards and tackles deployed to Hein’s right and only the end on his left. The right end was split approximately 20 yards toward the sideline. Newman stepped up from his tailback position directly under center. On the first signal, the left end stepped back, making Hein eligible, and the wingback stepped up to cover the right tackle and the right end stepped back. Hein snapped the ball into Newman’s hands, who handed it right back to Hein. The line fired off to their right, Newman followed the fullback into the line as if he still possessed the ball and was brought to the ground by Musso. While this was going on, Hein nonchalantly walked forward approximately five yard with the concealed ball. Chicago had been completely fooled. None of the Bears defenders had paid any attention to the center, but Hein suddenly broke into a sprint toward the goal line. Brumbaugh alertly saw Hein take off and chased him down after a 30-yard gain. The Bears held and kept New York off the scoreboard. In the second quarter, Grange returned Richards’ punt to the Giants 46-yard line. Ronzani caught a 15-yard pass on second down at the Giants 29-yard line. A short rush and two incomplete passes brought Manders out for another field goal, which was good from 40-yards and gave Chicago a 6-0 advantage. New York returned the kickoff to their 38-yard line. On second-and–five, Richards bucked into the line, bounced off Lyman and charged through the secondary until he was brought down at the Chicago 29-yard line. Newman threw a scoring strike to Badgro and Strong’s point-after placement marked the game’s first lead change as New York moved ahead 7-6. 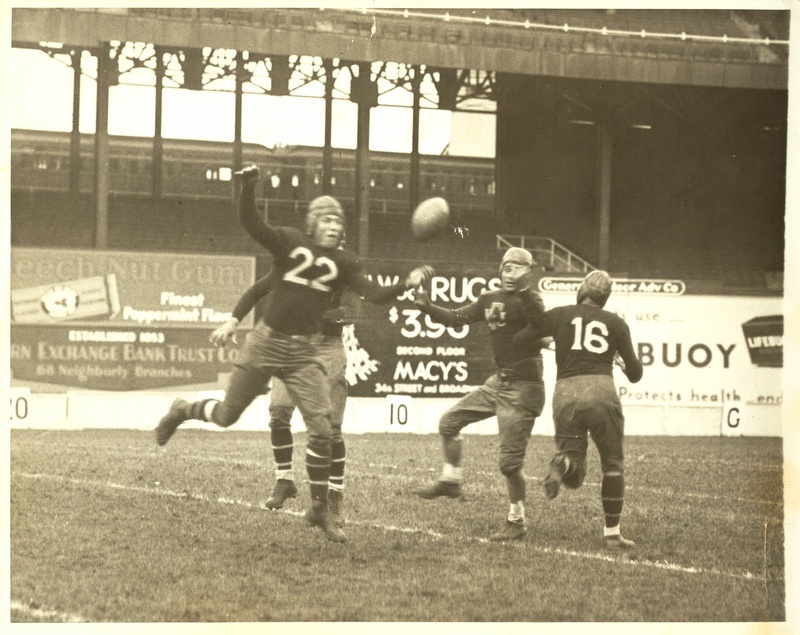 The score held to halftime, as a long Chicago drive resulted in a rare Manders’ missed field goal attempt. In the third quarter, Richards punted out of bounds at the Bears 37-yard line. Nagurski bulled through the line for a 14-yard gain to the Giants 49-yard line. After an incomplete pass and three-yard Ronzani plunge, Nagurski picked up seven yards on a cut back through the line for a first down. George Corbett completed a 27-yard pass to Brumbaugh before New York stuffed three rushes. Manders was good on his third field goal, this one from 18-yards, to put Chicago back on top 9-7. Newman returned the kickoff to New York’s 27-yard line and completed a pass to Burnett on first down to the 50-yard line and then another pass to Burnett to the Bears 37-yard line. On second-and-10, Richards bucked for six yards and on third down Newman connected with Badgro to Chicago’s nine-yard line for a first-and-goal. New York was penalized for illegal motion, so on first down from the 14-yard line, Newman completed a 13-yard pass to Max Krause who was pushed out of bounds at the one-yard line. Richards was stuffed on a plunge by Lyman, but Krause went over for the score on third down. Strong’s placement put New York ahead 14-9. The mutual offensive momentum was irresistible. Corbett returned the kickoff to the Bears 23-yard line, then alternated plunges with Nagurski for a combined seven yards. One third-and-three from the 30-yard line, Nagurski was stopped after a gain of one. Chicago was flagged for illegal motion on the play and the Giants accepted the five-yard penalty to give Chicago a third-and-eight. 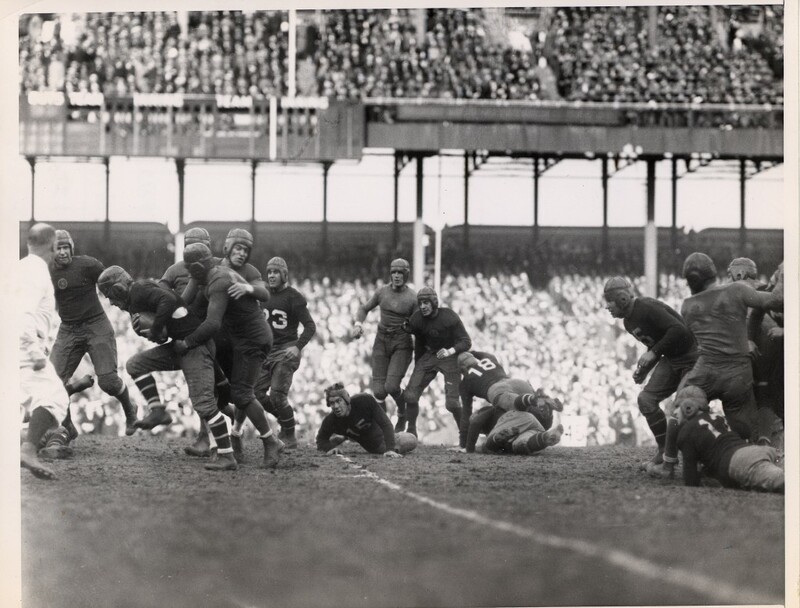 From a punt formation, Corbett passed to Brumbaugh who traversed through open field down to New York’s eight-yard line, a gain of 67 yards which had the Wrigley Field stands in a state of bedlam. Two rushes netted two yards, and on third-and-goal, Nagurski faked a plunge and lobbed a pass over the line to Karr in the end zone – the same exact play that had won the championship in the playoff against Portsmouth the previous season. Manders’ placement put Chicago back ahead, 16-14, the third lead-change of the quarter. Strong returned the kickoff to the Giants 26-yard line. Three consecutive Newman completions quickly moved New York to Chicago’s 25-yard line. After a false start, Newman completed his fourth consecutive pass, this one to Burnett, and the Giants had a first-and-goal on the Bears eight-yard line as the thrilling third quarter ended. On the fourth quarter’s first play, Newman handed off to Strong who ran a slant to the left, spun and lateraled the ball back to Newman. Chicago’s defense reacted to the ball and changed direction. Newman spotted Strong alone in the end zone and finished the drive with his fifth completion and a touchdown to regain the lead. Strong said, “Newman handed off to me on a reverse to the left, but the line was jammed up. I turned and saw Newman standing there, so I threw him the ball. He was quite surprised. He took off to his right, but then he got bottled up. By now I had crossed into the end zone and the Bears had forgotten me. Newman saw me wildly waving my hands and threw me the ball. I caught it and fell into the first-base dugout.” Strong’s placement put New York on top again, 21-16. The Bears received the kickoff and generated two first downs as they advanced to midfield. New York’s defense held its ground and forced a punt. The Bears defense responded in kind and forced a Giants punt after three downs. The Giants got the ball back when Ronzani threw a deep pass that was intercepted by Krause at the Giants 35-yard line. Unable to move the chains, New York went three-and-out again and gave the Bears favorable field position in doing so. Strong received Hein’s true snap, but Chicago pressure quickly penetrated and rushed the punting attempt. The ball went straight up in the air and bounced forward for a net of nine yards. The Bears started their third possession of the fourth quarter on the Giants 47-yard line. 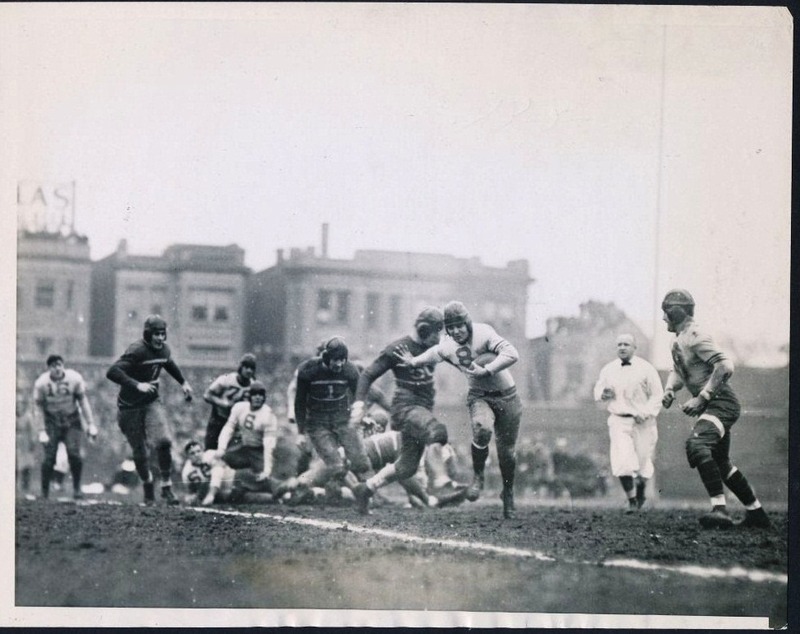 A nine-yard pass and Nagurski run gave Chicago a first down on the Giants 33-yard line. 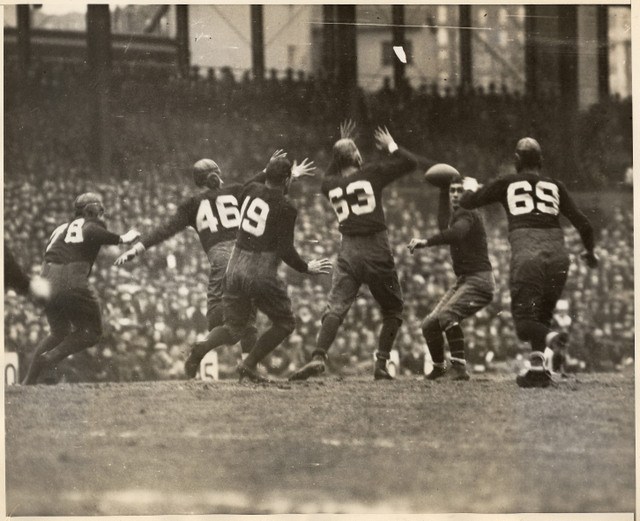 Nagurski faked a plunge and completed a jump pass to Hewitt who raced through the secondary. As two defenders converged on Hewitt at the at the 20-yard line, he lateralled to Karr who continued diagonally toward the sideline, then cut back to pick up a block on a defender, and ran the distance for the go-ahead touchdown. Brumbaugh’s placement put the Bears ahead 23-21 with three minutes on the clock. The Giants looked to strike fast after receiving the kickoff, and lined up in the same unbalanced formation where Hein had run with the snap-handoff in the first quarter. Only this time, Newman took the snap and pitched to Burnett who ran right, while Hein released as a receiver. The Bears were fooled a second time, but Burnett was pressured by the pass rush and his throw was high and wobbly. The arc of the ball allowed Molesworth to recover and knock the ball to the ground incomplete before Hein could get his hands on it. After moving the chains there was time left for just one more play, and Newman called for a hook-and-lateral. Newman completed a pass to Badgro who had Burnett trailing him. Grange had been in position and when tackling Badgro, he noticed Burnett looking for the ball. As he wrapped up Badgro, Grange pinned Badgro’s arms to his body. Badgro was unable to release the ball to the wide open Burnett as Grange wrestled him to the ground. For the very first time, pro football was acknowledged as a leader, something to be emulated, not scorned. It would be some time before the tag “post-graduate” would be retired for good, but during that chilly and wet afternoon at Wrigley Field, the pendulum swung in the pros favor and there would be no looking back. The New York Football Giants have won eight world championships in their 90 seasons in the National Football League, and trail only the Chicago Bears and Green Bay Packers in that regard. The three franchises post-season histories are intertwined so deeply with one another that they share some of the same DNA. One cannot recount the history of one of these teams without including the others. The Giants have tangled in the post-season eight times with the Bears and seven times with the Packers. In the 30 year span from the start of divisional play in 1933 until 1963, New York met these two ancient Western Division/Conference rivals 11 times in NFL Championship Games. Unfortunately for the Giants, they only won three of those games. 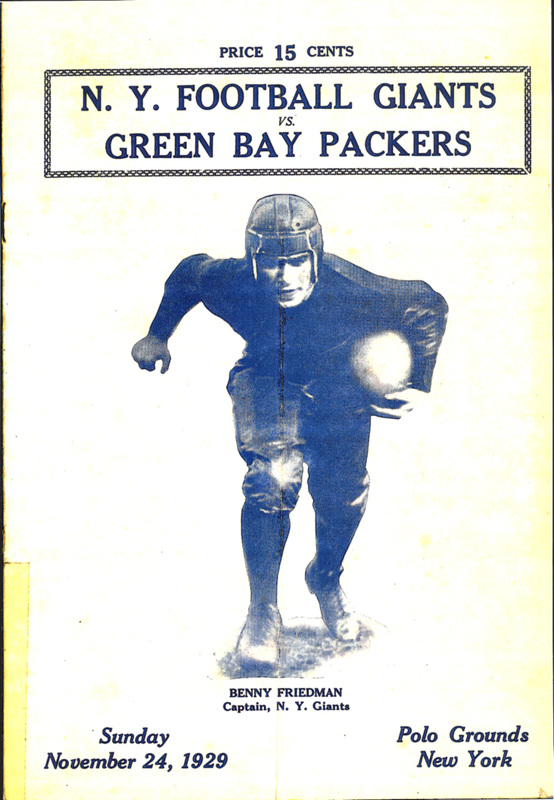 They were twice victorious over Chicago (1934 and 1956) and once over Green Bay (1938). All three wins were in New York. The first two occurred in their original home, the Polo Grounds, and the third in venerable old Yankee Stadium. But the competitive roots of these three flagship franchises go even deeper. Prior to divisional play, the NFL was stacked top-to-bottom in a heap of random, unbalanced, make-it-up-as-you-go scheduling that was sometimes interspersed with non-league exhibitions. It was such a mess at times that the league didn’t even calculate ties in win percentages. Disputes over final standings were commonplace and interested parties often resorted to politicking for several months after the season closed, lobbying for votes at the spring owners meeting where a ballot was cast to officially declare the previous season’s champion. 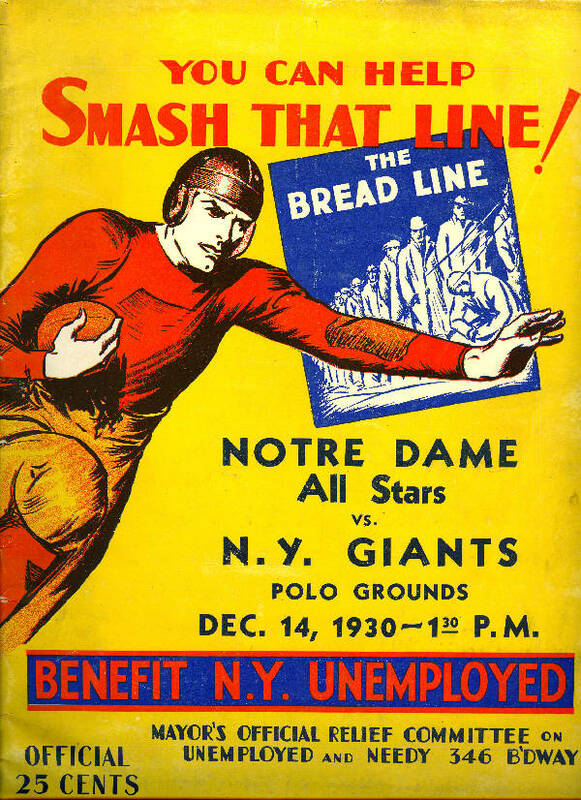 The Giants fate was often determined during November and December contests with Chicago and Green Bay. 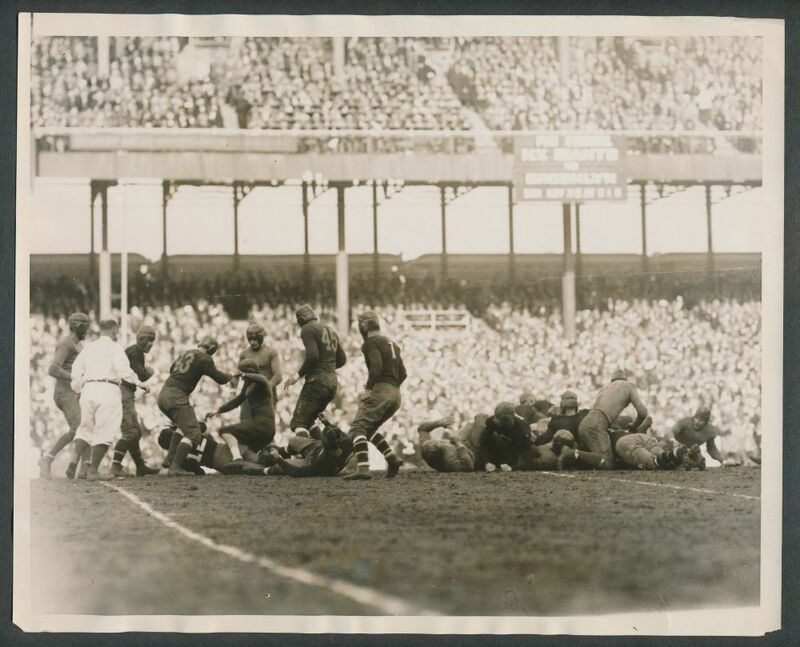 The Giants earned their first NFL title in 1927 after a pivotal December Polo Grounds slugfest against the Bears that was such an epic struggle it rendered the subsequent sweep of the hated New York Yankees anti-climactic. Some of the Giants strongest teams, ones that set records and had the biggest stars of their day, fell just short of the ultimate goal. This is the story of one of those bitter disappointments. The 1929 New York Giants were remarkable in their own unique way and are worthy of remembrance and celebration of their accomplishments. There is little wonder why Giant co-owners Tim Mara and Dr. Harry March were obsessed with passing sensation Benny Friedman. While his NFL-best 20 touchdown passes his first two years in the league may not seem impressive, consider the league’s next highest scoring team in 1927-28, the Frankford Yellow Jackets. Their leading passer, Ken Mercer, combined for nine touchdown passes in those two seasons. Moreover, the Yellow Jackets played 34 games during that timeframe while Friedman’s two teams played 23. Yardage statistics from this era are incomplete and unreliable, but the box scores don’t lie. Nobody has ever questioned the value of a passer who gets the ball into the end zone. Even more impressive was the fact that Friedman accomplished this with two different franchises. 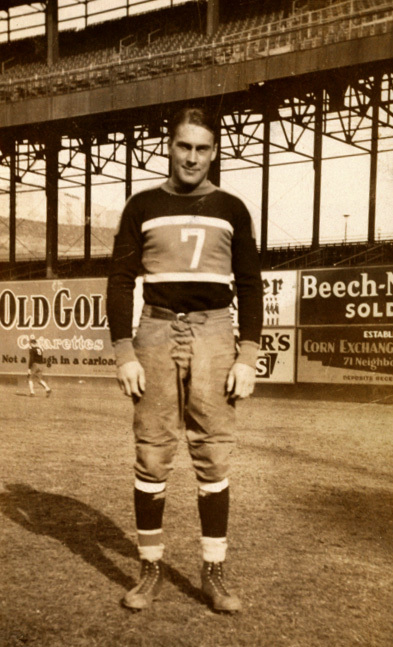 In his rookie season, Friedman and the 1927 Cleveland Bulldogs led the NFL in scoring. However, the financially strapped Bulldogs disbanded after the season. 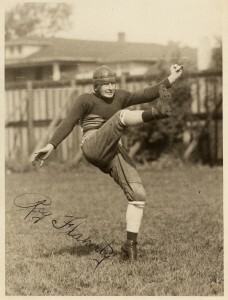 Friedman and several of his teammates signed on with the Detroit Wolverines (most player contracts were one-year deals anyway), where they led the NFL in scoring again in 1928. In those two years, Friedman and his rag-tag squads squared off with the defensive-minded Giants four times without a loss; the best New York managed was two ties. One of the defeats was thoroughly embarrassing, as Friedman torched the Giants with his legs and arm in a 28-0 blowout at the Polo Grounds. Mara resolved this problem with his purchase of the entire Wolverines franchise in early 1929. To ensure Friedman would agree to play for the Giants, Detroit coach LeRoy Andrews was installed as the head man of the Giants squad. In an era dominated by power struggles on the line of scrimmage, punts and drop-kicks, it did not take long for Friedman to become noticed with his passing wizardry. He was the lead man in newsreel highlights with the NFL’s two other transcendent stars, halfback Harold “Red” Grange of the Chicago Bears and fullback Ernie Nevers of the Chicago Cardinals. While all three played defense as well as offense, Friedman and Nevers were triple threats who handled the bulk of their respective teams kicking duties. The Giants gained one star but lost another. The indomitable Cal Hubbard, who was a catalyst for the Giants championship 1927 season, was unhappy living amongst the hustle and bustle of New York City. He preferred a quieter and simpler existence. After playing in a Giants-Packers game in Green Bay in 1928, Hubbard decided that was the place for him. He requested a trade after the season and was accommodated. The Giants opened the 1929 regular season in front of 9,000 fans at Knights of Columbus Stadium when they visited the Orange Tornados. The results were familiar in that the defensive battle lacked any portent of offensive genius. New York had a golden opportunity to take the lead early in the second quarter when Ray Flaherty, who jumped from the Yankees to the Giants late in 1928, intercepted a pass at the Giants 45-yard line and returned it to the Orange 10. The Tornados thwarted New York on second-and-goal when they intercepted a Friedman throw. The Giants star had an opportunity to redeem himself in the closing minutes of the game. Friedman drove New York into Orange territory, but his attempted field goal was blocked as time expired, and the game ended in a 0-0 tie. 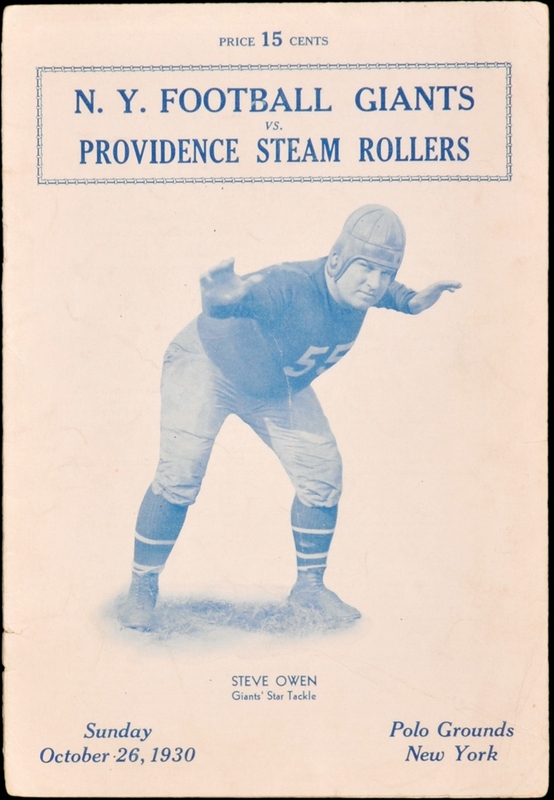 Another defensive battle took place in front of a record throng of 14,000 in Providence when the Giants visited the defending champion Steam Roller. 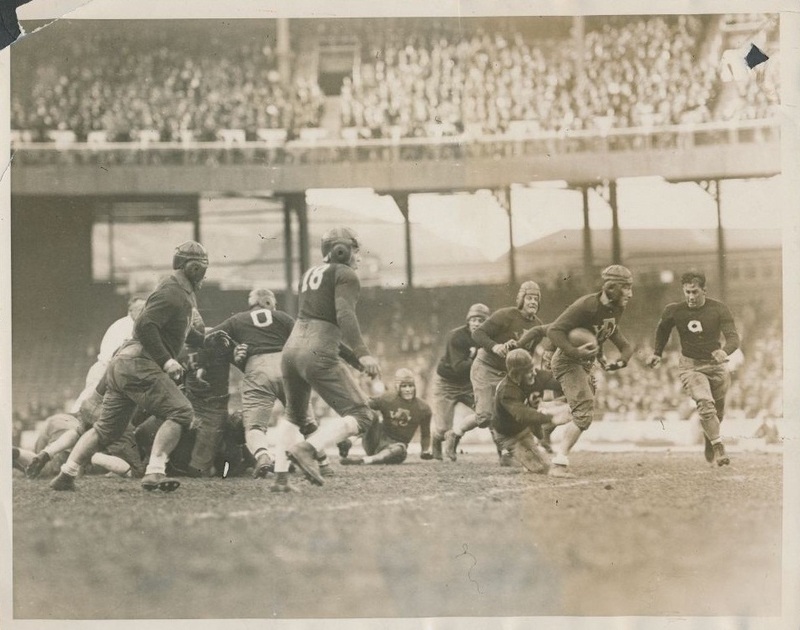 The Providence Journal described the contest as “one of the most bitterly fought games ever seen at the Cycledrome.” The Giants first touchdown of the year came early in the first quarter, and it was mostly a Friedman effort. He set the drive up with a 25-yard punt return before completing successive passes totaling 43 yards. Len Sedbrook then scored from nine-yards out and Friedman’s point-after was successful. That was all of the scoring for the day, but there was plenty of action on the field. First-hand accounts described the Steam Rollers defense as being “savage.” The Giants drove twice more into goal-to-go situations, many of the advances coming from Friedman off-tackle slants, but the Giants were halted on the 1- and 6-yard lines, respectively. Providence was never able to harness any momentum offensively, as New York limited them to just 10 first downs. The Giants won 7-0. Friedman shared the spotlight with Jack Hagerty the following week at the Polo Grounds for the home opener versus the Staten Island Stapletons. Of the 30,000 spectators, approximately 5,000 enthusiastically supported the visitors. Friedman threw the Giants first touchdown pass of the year in the second quarter, but Ken Strong’s 50-yard touchdown rush and point-after gave Staten Island a 9-7 lead at the half. Hagerty sparked New York with a second-half kickoff return to the 30-yard line and two rushes for 11 and 25 yards, setting up a Friedman-to-Hap Moran touchdown connection. In the fourth quarter, Moran caught a scoring aerial from Hagerty to cap off the 19-9 win. So impressive was Hagerty that The New York Times tagged him as “Ghost Hagerty,” a moniker closely associated with the legendary Grange. 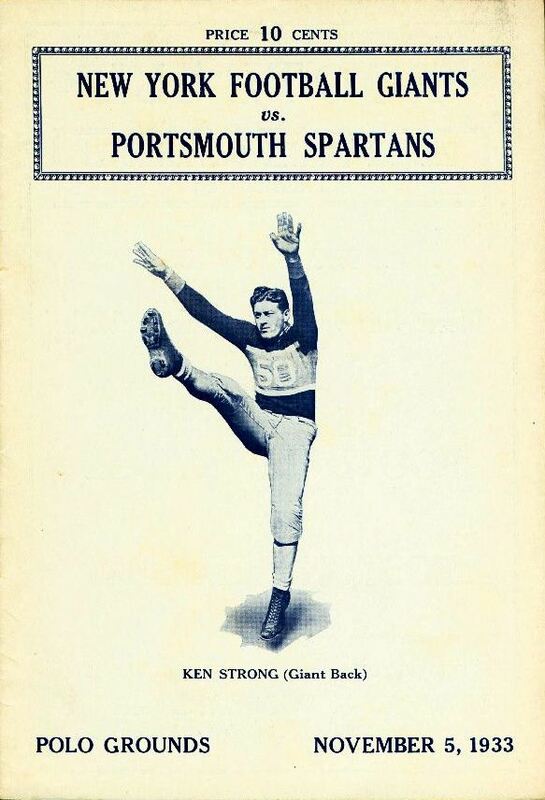 Future Giant Ken Strong (1933-35, 1939, 1944-47) drew acclaim for his effort both running and kicking. At the close of the third quarter, his punt from the Stapleton’s 18-yard line flipped field position as the ball was downed on the New York 20. The New York Times estimated the ball traveled close to 75 yards in the air. The Giants momentum carried over to next week’s game against the Frankford Yellow Jackets. Former New York Governor Al Smith was among the 30,000 fans at the Polo Grounds who were treated to a rare offensive showcase. “Friedman, the Giants passing wizard, was the man behind the New York surge,” wrote The New York Times. In the second quarter, Friedman “suddenly began to complete passes all over the lot,” which included scoring strikes of 18, 43 and 25 yards. Leading 19-0 at the half, the Giants switched to the ground game, but the big plays kept coming. Mule Wilson romped 55 yards for a touchdown and in the fourth quarter. Then center Mickey Murtagh was given a turn in the backfield and rambled for a 33-yard touchdown. Frankford only completed two passes for 12 yards on the afternoon while the Giants front stonewalled the run in the 32-0 victory. Big scoring plays and one-sided wins now became the norm for the Giants. The first four games in November were dominated by Friedman’s passing and an unyielding defensive front wall. Shutouts over aforementioned Frankford (32-0) and Providence (19-0) preceded a tough 26-14 win at Cubs Park over the 4-1-1 Chicago Bears. The road trip resumed just two days later in Buffalo for a Tuesday 45-6 win at Bison Stadium. New York’s first scoring drive took two plays, both Friedman-to-Flaherty connections. Sedbrook later scored on a 70-yard pass from Friedman and Flaherty caught a 50-yard scoring pass from Moran. Things were so bleak for the Bisons that after they scored their only touchdown, Hagerty returned the kickoff 97 yards for another Giants tally. Five days later, the Giants soundly defeated the Orange Tornados 22-0. The Giants overall record now stood at 7-0-1. The re-match with the Bears at the Polo Grounds was shockingly similar to the game against the Bisons. Chicago came to New York on a skid, having lost to Green Bay and Frankford, and nobody expected anything but a stout effort from George Halas’ squad. The looming threat of bad weather limited the crowd to 15,000, but the ones who braved the elements were rewarded with a record performance. The Friedman aerial circus was unstoppable. The heavy air above the Polo Grounds was filled with 49 New York pass attempts, five resulting in touchdowns. Four of those scoring tosses came from the arm of Friedman, and one by Moran, who was also on the receiving end of two scores. Early on though, Chicago had the edge. The action was mostly on the New York side of the field and Grange, who played with a dislocated shoulder, looked to be the star of the game. After a catch-and-run by the Galloping Ghost gave Chicago a first-and-goal at the 2-yard line, New York forced a fumble and recovered. The momentum swing sparked the Giants, whose drive carried over into the second quarter, and ended with Friedman’s first scoring pass. The remainder of the first half saw numerous punt exchanges, including a 70-yarder by the Giants off of the foot of Tony Plansky. The Giants 20-point third-quarter eruption quickly put the game out of reach. Unofficially, Friedman was 13-of-25, four touchdowns, and no interceptions while the Bears as a team were 11-of-24 and intercepted four times. When it was over, New York won 34-0. There was considerable buzz anticipating next week’s match-up against Green Bay. The 9-0 Packers were tied atop the standings with the 8-0-1 Giants (ties did not factor into win percentage.) Green Bay’s strength was their defense. Cal Hubbard had been moved inside to the tackle position where he continued to wreak havoc. Also on the line were future Hall of Fame guard Mike Michalske and All-Pro end Lavvie Dilweg. 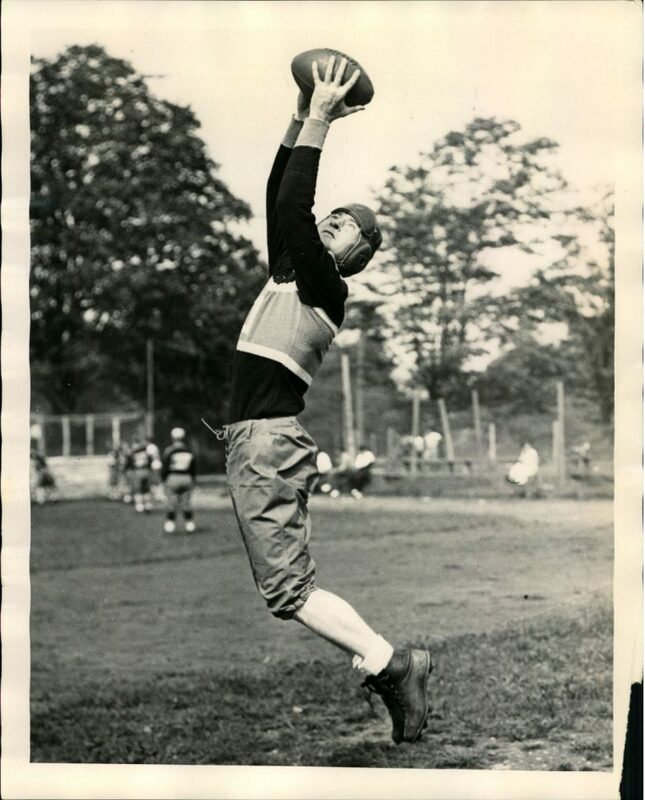 Halfback Johnny “Blood” McNally, who played end on defense, would also be enshrined in Canton, along with head coach Curly Lambeau, who had finally hung up his cleats and was on the sideline full time. Green Bay went straight at the Giants on the cold, muddy field. Hubbard punched holes in his former team’s first line of defense for fullback Bo Molenda’s advances. The Polo Grounds crowd of 25,000 remained enthusiastic despite Green Bay taking an early 7-0 on a Verne Lewellen touchdown pass to Herdis McCrary. The Giants had an opportunity to answer when Friedman connected with Flaherty for a 65-yard gain. Flaherty was headed for the end zone until he was caught from behind by McNally and dragged down at the 10-yard line. It was a significant play as Freidman’s next attempt was intercepted and the 7-0 score held. The remainder of the first half was scoreless while both powerful lines slugged it out. Lewellen kept the Packers out of danger with 60- and 70-yard punts. Friedman and the Giants struggled to find the rhythm of their passing game that had propelled their success over the past seven games. Even when Friedman wasn’t feeling the rush of Green Bay’s line, his favorite target, Flaherty, struggled to find open space against his counterpart McNally. Green Bay controlled most of the first 30 minutes of action, but New York fought back. In the third quarter, Friedman completed three passes, interspersed with several line plunges, on a 70-yard drive. Plansky caught the final pass in the end zone to trim the lead to 7-6, as Friedman missed the point-after attempt. The game resumed its tenor from the first half as the lines engaged in their contest of will. The New York passing attack struggled under the Packers pass rush while Green Bay ran plunges and slants into the Giants defense. The balance of the game tipped suddenly in the fourth quarter. New York seemed to have stopped an advance on third down and set up for a return. Having witnessed Lewellen boom punts consistently all day, the Giants dropped back on fourth down to ready themselves for a return. Lewellen received the snap, skillfully mimed a punting motion, and then connected with McNally on a 26-yard pass. The gain in field position was secondary to the emotional blow dealt to the Giants – they sagged while Green Bay surged. Molenda and McRary ran with confidence through the Giants front wall and finished the 80-yard drive with a touchdown run and a 14-6 lead. Friedman’s comeback bid ended in disaster. Harassed in a collapsing pocket, he was intercepted by middle guard Jug Earp. The Packers kept the ball on the ground, consuming both time and yards . They put the game away when McNally went over for the touchdown, finishing the 37-yard drive and the Giants bid for first place. 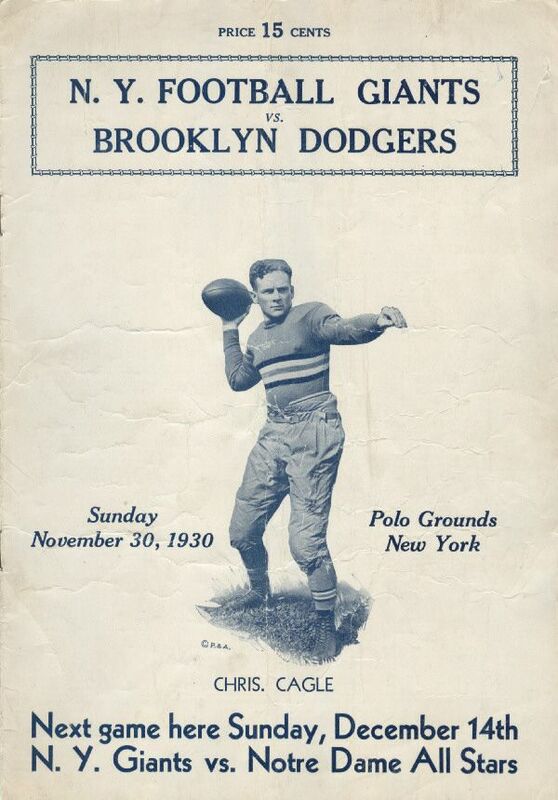 Green Bay left the Polo Grounds with a 20-6 victory and 10-0 record while the Giants slipped to 8-1-1. Bruised and beaten, but not without hope, the Giants had a chance to force a tie if they won out and Green Bay dropped a game. It was a short week for both teams as they both played four days later on Thanksgiving. The Giants handled rival Staten Island 21-7, while Green Bay showed some signs of exhaustion as their road trip continued. The game account from Frankford noted the Packers exhibited signs of fatigue after their strenuous effort at the Polo Grounds. The Yellow Jackets advanced to the Packer 2-yard line in the first quarter before turning the ball over. In the fourth quarter, a final promising drive by Frankford ended with a blocked field goal. The game ended in a 0-0 tie and the Packers still sported a perfect 1.000 winning percentage. The race continued three days later. 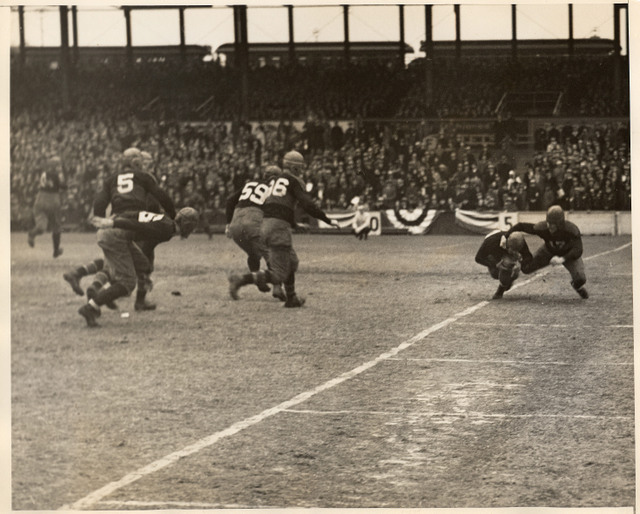 Green Bay romped over the Steam Roller in Providence 25-0, while the Giants entertained the Polo Grounds faithful in a thriller against Ernie Nevers and the Chicago Cardinals. 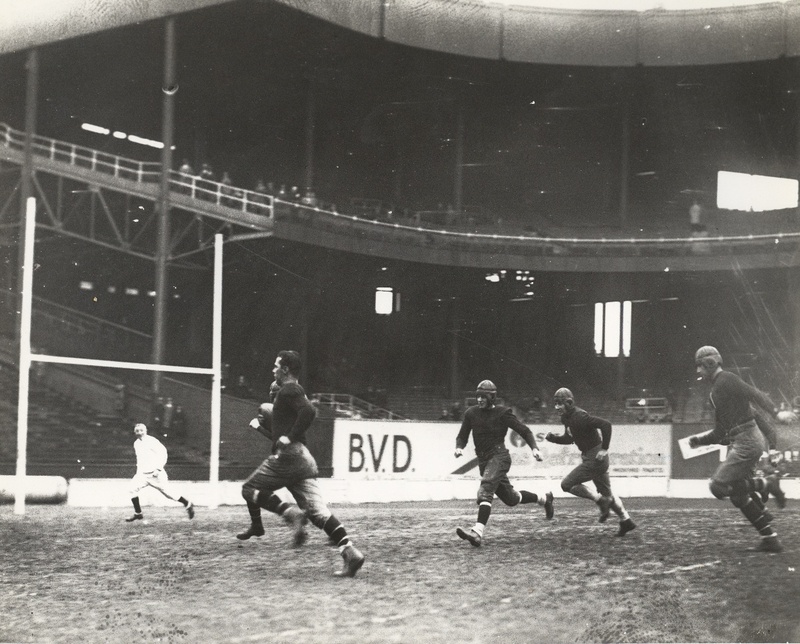 Bitter cold temperatures held the crowd to 5,000 but New York turned up the heat early with two Friedman scoring passes. Nevers brought his squad back, throwing a touchdown pass of his own. Chicago added a safety just before the half, and trailed at the break 14-9. Gene Rose went over for a touchdown in the third quarter to give the Cardinals a 15-14 lead as the point-after attempt failed. Nevers extended the lead to 21-14 with his plunge early in the fourth quarter, again, the point-after failed. Led by Plansky, the Giants came back. When he wasn’t carrying the ball on the 80-yard march, Plansky was leading the way with clear-out blocks. He carried the ball on three of the four first-down conversions and went over for the touchdown to complete the drive. Friedman’s placement was good and the game was tied at 21. Although a tie score would not hurt the Giants in their race against Green Bay, a victory could only help their cause. After forcing a Cardinals punt, New York advanced on a long drive. As the clock ran under five minutes, Friedman was intercepted by Rose at the Chicago 10-yard line. After moving the chains for a first down on two line plunges, Chicago lost a chance to run the clock out when Rose fumbled and Joe Westoupal recovered at the 22-yard line for New York. Friedman was thrown for a 13-yard loss on first down, which pushed the Giants out of sure field-goal range. A completion to Len Sedbrook moved the ball to the 24-yard line. Friedman connected with Sedbrook again at the nine-yard line while the clock ran under one minute to play. On first-and-goal, Friedman was thrown for a loss at the 20. There was time left for just one play. Plansky received the snap from center and booted a drop-kick from the left hash on the 32-yard line, which went through the uprights as the timekeeper’s whistle blew. The Giants escaped, pulling out the 24-21 win. New York rolled through the remainder of their schedule. Back-to-back shutouts over Frankford (12-0 and 31-0) preceded a 14-9 win at Cubs Park again over the Bears. Unfortunately for the Giants, Green Bay held serve and finished their schedule with a 25-0 romp over the Bears to close their unbeaten campaign 12-0-1, just ahead of New York’s 13-1-1 tally. In a league yet without a championship game, the Green Bay Packers were crowned NFL Champions. The Giants still had much to be proud of. 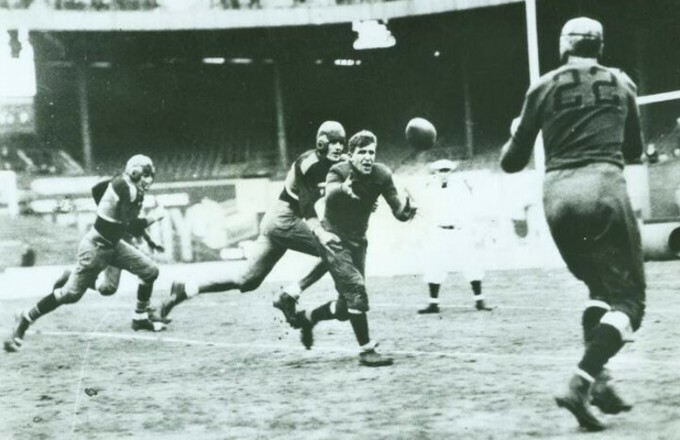 Friedman’s 20 touchdown passes set a standard that would stand until 1942. For the third season in a row, Friedman’s team led the NFL is scoring. The Giants scored 312 points (no other team reached 200), averaging 20.8 points per game while the league as a whole averaged 9.6. The output was the second-highest total in NFL history up until that point. The record of 326 had been set by Frankford in 1924, but they accomplished it in a very different style. Of their 43 offensive touchdowns, 38 came on the ground and only five through the air. 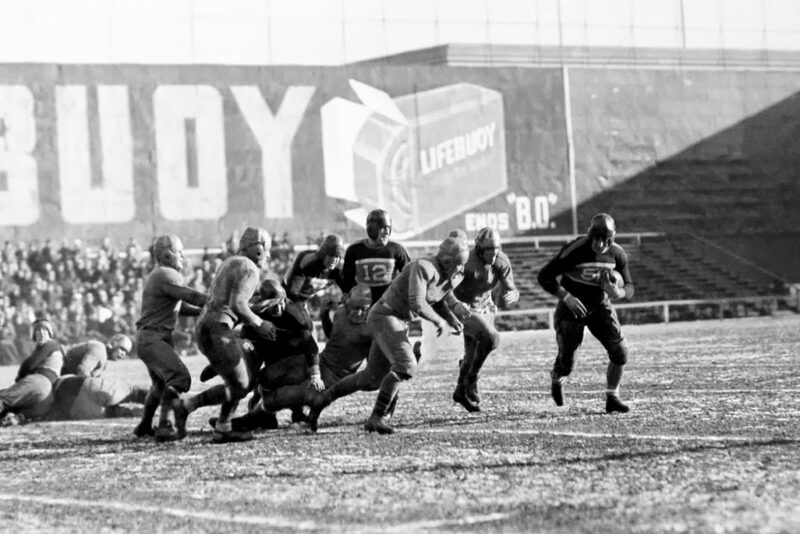 The 1929 New York Giants scored 45 touchdowns from scrimmage, 19 rushing and 26 passing. The Giants scoring differential was the best in the NFL at +226. The champion Packers were second with +176. It is not surprising that the top three scoring receivers in the NFL were all Giants. Flaherty was first with eight, Sedbrook second with six and Moran third with five. Individual honors were bestowed upon four Giants. Named first-team All-Pro were center Joe Wostoupal, tailback Benny Friedman, fullback Tony Plansky and end Ray Flaherty. The difference in the season was the November meeting between what were clearly the two best teams that year. The balance of power undoubtedly swung with the offseason trade of future Hall of Famer Cal Hubbard. Green Bay was able to control the tempo of much of that 20-6 win with their line play. It was the only contest that season where the Giants were outplayed on the line of scrimmage. Their front could not contain the Packers running game nor protect their passer. It is no stretch to believe that had Hubbard been amiable to staying in New York, the Giants would have won their second title in 1929. History would repeat itself as Green Bay and New York continued to be the top two teams in the NFL again in 1930. The Giants led the NFL in scoring on Friedman’s right arm while they chased the methodical Packers in the standings. They split their head-to-head meetings that year, with each team victorious on its home field. At season’s end, Green Bay was first at 10-3-1 and the Giants second at 13-4-0. The NFL’s preposterous practice of not counting tie games was significant here. Not counting the tie, the Packers finished with a 0.769 win percentage and the Giants with a 0.765 win percentage. Retroactive application of the current method of calculation where a tie game is treated as a half-win and half loss, the Packer’s win percentage drops them into second place at 0.750. In other words, the Giants would have been crowned NFL Champions using the current formula. The Giants slipped to 7-6-1 in 1931. Friedman suffered a serious knee injury that forced him to miss six games and limited his effectiveness the remainder of his career. He left the Giants during the offseason in 1932 after a contract squabble with Tim Mara. Friedman wanted the interest in the team that had been surrendered by Dr. March. 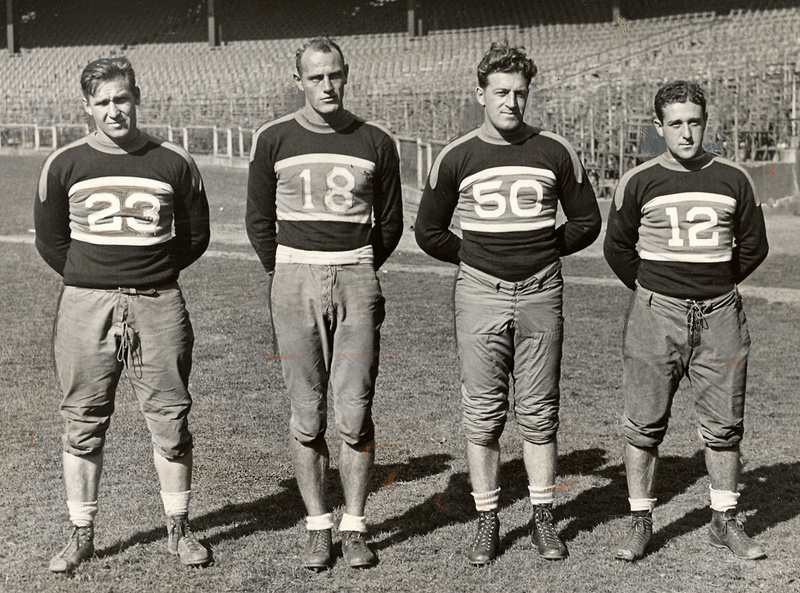 Friedman moved on to become player/coach for the Brooklyn Dodgers for the next three seasons, while also serving as the head coach for the Yale football team. The Giants drafted tailback Harry Newman from the University of Michigan in 1933 as Friedman’s replacement. 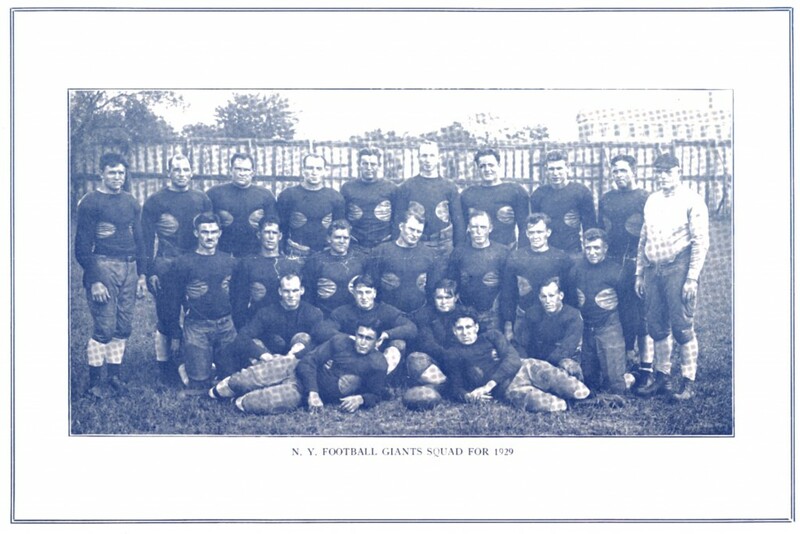 The Giants would play in the NFL’s first Championship Game that same year against the Chicago Bears.